Dave Blaney picked up the 18th last-place finish of his NASCAR Sprint Cup Series career in Sunday’s AAA 400 at the Dover International Speedway when his unsponsored #36 Tommy Baldwin Racing Chevrolet went behind the wall with electrical problems after completing 29 of the race’s 400 laps. 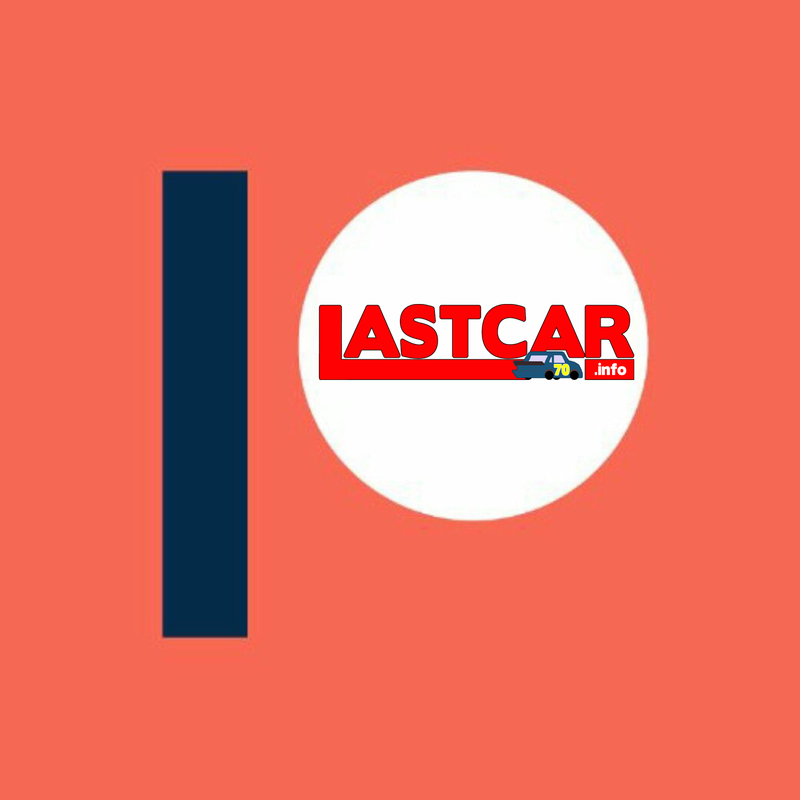 The finish moved Blaney into sole possession of 5th in the LASTCAR Cup Series rankings, trailing only J.D. McDuffie, Derrike Cope, Joe Nemechek, and G.C. Spencer for the overall lead. He also stands alone 6th in the overall LASTCAR rankings, trailing Morgan Shepherd and Jeff Fuller in addition to Cope, McDuffie, and Nemechek. After DNQing at Watkins Glen last month, Blaney departed PRISM Motorsports’ #66 team in search of new Cup Series rides. In the six races since, he has driven both Baldwin’s #36 and Front Row Motorsports’ #38 for five combined races, and has finished under power at the end of three of them. At Dover, Blaney qualified 38th for the race at a speed of 152.562 mph, more than enough to bump out Ted Musgrave in Blaney’s old #66. Unfortunately, as with the team’s last appearance at Dover (when Johnny Sauter drove the #36), Blaney’s Chevrolet was without sponsorship, forcing him to leave the race early. Curiously, the #36 has not only swept both last-place finishes at Dover in 2010, but in both cases exited the race after 29 laps. J.J. Yeley, making an unexpected return to Whitney Motorsports to drive its unsponsored second car, finished 42nd in the #81. Current LASTCAR Driver’s Championship leader Joe Nemechek fell out 15 laps later and finished 41st. Nemechek now has a one-finish lead on both Blaney and McDowell, former PRISM Motorsports teammates who are the two most recent last-place finishers in Cup Series competition. Nemechek has not finished last in a Cup race since Michigan, six races ago. *This was the second time in 2010 that the same number finished last in both the Cup Series and Nationwide Series events on the same weekend: the #82 finished last with Matt Carter (Nationwide) and Scott Speed (Sprint Cup) at Watkins Glen last month. *Blaney had never before finished last in a Cup race at Dover. Jeff Green picked up the 12th last-place finish of his NASCAR Nationwide Series career in Saturday’s Dover 200 at the Dover International Speedway when his unsponsored #36 TriStar Motorsports Chevrolet fell out with brake problems after completing 1 of the race’s 200 laps. The finish moved Green to 3rd in the LASTCAR Nationwide Series rankings, tying him with Johnny Chapman, Brad Teague, and Tommy Houston. Driving for Latitude 43 Motorsports, Green failed to qualify for his second-straight Cup Series race on Friday, but made the Nationwide Series race the next day, timing into the latter 28th at a speed of 149.800 mph. At the start of the race, Green was the first of four drivers to go behind the wall on consecutive laps, starting after the first circuit. Current Driver’s Championship leader Dennis Setzer pulled the #92 behind the wall on lap 2, followed by owner Brian Keselowski’s #26 and Johnny Chapman in Morgan Shepherd’s #89. Among the five teams that failed to qualify for Saturday’s were the #56 of Kevin Lepage, two weeks after driver and team finished last at Richmond, and Watkins Glen last-placer Matt Carter in Randy MacDonald’s #82. 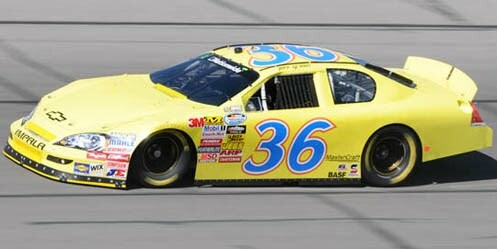 *The #36 had not finished last in a Nationwide Series race at Dover since 2007, when Brent Sherman’s BIG LOTS Chevrolet was involved in a multi-car crash after completing the 10th lap of the 2007 RoadLoans.com 200. *2010 marks the most last-place finishes Green has amassed in a single Nationwide Series season, breaking his previous record of three in 1996. *Green had never before finished last in a Nationwide Series race at Dover. 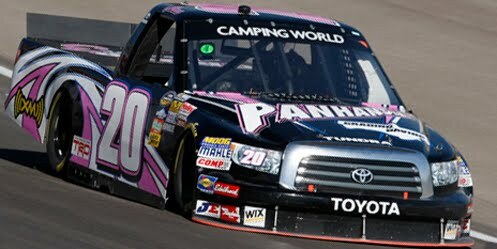 Johanna Long picked up the 1st last-place finish of her NASCAR Camping World Truck Series career in Saturday’s Smith’s 350 at the Las Vegas Motor Speedway when her #20 Panhandle Grading and Paving Toyota fell out with transmission problems without completing a single lap of the 146-lap race. The finish came in Long’s 4th series start. The eighteen-year-old Long qualified an impressive 16th for Saturday’s race at a speed of 171.739 mph, and she has now qualified in the Top 20 in all four of her Truck Series starts. This run was particularly impressive as she was racing a truck she co-owned for the first time. Unfortunately, she did not have much time to enjoy the starting spot as her truck failed to start the race. Current LASTCAR Driver’s Championship leader Mike Garvey fell out after eight laps and finished 34th. The #95 Team Gill Racing Dodge, driven again by last week’s last-place finisher J.C. Stout, was one of the four trucks that failed to make the race. Gill’s team still holds a two-finish lead over Garvey’s #93 in the LASTCAR Owner’s Championship. *The #20 had not finished last in a Truck Series race since 2006, when Marcos Ambrose’s Team Australia / Aussie Vineyards Ford crashed after completing 4 laps of the 2006 Quaker Steak & Lube 200 at Charlotte. The number had never before finished last in a Truck Series race at Las Vegas. *A female Truck Series driver had not finished last since last fall at Talladega, where Jennifer Jo Cobb’s #50 Boys Racing Dodge lost its engine after the opening lap of the 2009 Mountain Dew 250 Fueled By Fred’s. *This was Toyota’s first last-place finish in the 2010 Truck Series season, ending a seven-race last-place streak by Dodge that dated back to Pocono in June. 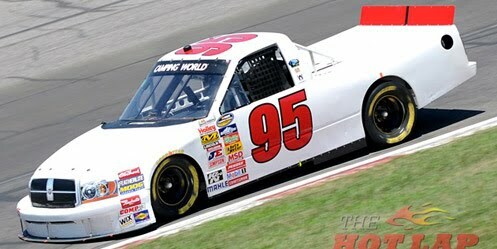 *Incredibly, a Toyota had not finished last in a Truck Series race since 2008, when Sean Caisse’s Germain.com / Lumber Liquidators #9 left the 2008 Kroger 200 at Martinsville with crash damage after 44 laps. 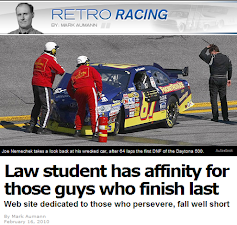 *A Truck Series driver had not finished last without completing a single lap since this year’s season-opening NextEra Energy 250 at Daytona, where Landon Cassill’s EasyToInstall.com #98 was involved in a multi-car wreck in turn three. Michael McDowell picked up the 7th last-place finish of his NASCAR Sprint Cup Series career in Sunday’s Sylvania 300 at the New Hampshire Motor Speedway when his #46 Cash America Dodge fell out with engine problems after completing 29 of the race’s 300 laps. McDowell arrived at New Hampshire in one of owner Dusty Whitney’s new Richard Childress-prepared Chevrolets, likely the same one the team ran two weeks ago at Atlanta. Unfortunately, just one lap into the opening practice, an oil line ruptured, sending the car hard into the wall off turn two. McDowell was uninjured, but the car was destroyed. The team scrambled to get ready for qualifying, toiling hard to get their short track-setup Dodge ready for its timed lap. McDowell drove the car as hard as he could, timing in at 129.525 mph, but was not yet locked-into the field. Only when Travis Kvapil timed in slower was the #46 guaranteed the 38th starting spot. On race day, McDowell fell to the rear as early as lap 10, but moved up to 42nd when Scott Speed wrecked off turn four on the 26th circuit. On the restart, both McDowell and Landon Cassill, driving Larry Gunselman’s #64, pulled behind the wall with Cassill 42nd, poised to take last place from Speed, should he return. By the time the second caution ended on lap 44, McDowell and Cassill had returned to the track and gone to the garage a second time with McDowell falling to 42nd. Finally, when Speed returned to the track on lap 113, McDowell fell to last place. Current LASTCAR Driver’s Championship leader Joe Nemechek, who qualified 7th at the track in June, stayed out to lead lap 28 under the first caution and also went behind the wall a couple times before finishing 40th, having completed just 60 laps. UPDATE: After McDowell’s car went through mandatory post-race inspection as the lowest finishing non-wrecked car in Sunday’s race, NASCAR discovered that the valves to the #46's engine were too light. The engine, acquired from Gillette-Evernham Motorsports and rebuilt by Arrington Engines, resulted in the loss of 50 driver and owner points, plus a $50,000 fine. Crew chief Jeremy LaFaver has also been suspended from NASCAR competition for six weeks. *The #46 had not finished last in a Cup Series race since 2002, when Frank Kimmel’s Advance Auto Parts Ford fell out with overheating problems 8 laps into the 2002 Pocono 500 at Pocono. *It was owner Dusty Whitney’s first-ever last-place finish in Cup Series competition. *McDowell has now finished last for three different teams in the 2010 Cup Series season: Dusty Whitney’s #46, as well as both PRISM Motorsports’ #55 (3 finishes) and #66 (1). *McDowell’s last-place finish was the first by a Dodge in 2010. The last Dodge to finish 43rd in a Cup race was Tony Raines’ Long John Silvers #37 in last fall’s Checker O’Reilly Auto Parts 500 at Phoenix. *The finish also ended an incredible 14-race last-place streak by Toyota that was likely the longest by any manufacturer in NASCAR history. The last non-Toyota to finish last was Johnny Sauter’s run in Tommy Baldwin’s #36 at the Autism Speaks 400 at Dover back in May. J.C. Stout picked up the 2nd last-place finish of his NASCAR Camping World Truck Series career in Saturday’s TheRaceDayRaffleSeries.com 175 at the New Hampshire Motor Speedway when his unsponsored #95 Team Gill Racing Dodge fell out with electrical problems after completing 2 of the race’s 175 laps. Stout qualified 30th in the 36-truck field at a speed of 118.536 mph; the entry list was not long enough for anyone to fail to qualify. Stout was forced to go behind the wall early, followed two laps later by Donnie Neuenberger in owner Rick Ware’s also-unsponsored #6. *Stout became the first driver in 2010 to finish last for two different teams; his inaugural last-place finish at Michigan came while driving owner Rick Ware’s #16. *Owner Danny Gill’s #95 six last-place finishes have all come in the last seven races, giving the team a two-finish lead in the LASTCAR Owner’s Championship. 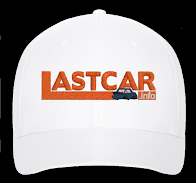 However, since Gill’s trucks have finished last with Stout, Carl Long, Tim Andrews, and Dillon Oliver, all four still trail current LASTCAR Driver’s Championship leader Mike Garvey. *The #95 had never before finished last in a Truck race at New Hampshire, nor had a driver done so with electrical problems as the listed cause. Kevin Lepage picked up the 10th last-place finish of his NASCAR Nationwide Series career in Friday’s Virginia 529 College Savings 250 at the Richmond International Raceway when his #56 Hyatt Place Richmond Airport Toyota fell out with fuel pump problems after completing 6 of the race’s 250 laps. The finish moved Lepage into a tie with Mike Harmon and the late John Linville for 5th in the LASTCAR Nationwide Series rankings and into a tie for 6th all-time with Dave Blaney. Lepage qualified 22nd for the race at a speed of 121.425 mph, his Toyota sixth-fastest among the “go-or-go-homers” more than fast enough to make Danny Efland’s #07 the only car to DNQ. During the opening green-flag run, Lepage pulled his new car behind the wall for the night. All-time LASTCAR leader Derrike Cope followed suit under the lap 12 caution, his brake problems leaving him 42nd at the finish. Cope has not finished last in a Nationwide Series race since the February race at Fontana last year. Current LASTCAR Nationwide Series leader Dennis Setzer and his #92 were again absent from the entry list, as was owner Brian Keselowski. In their place, Parker Kligerman made another fully-funded run at the checkers in Keslelowski’s #26 and came across the line in 15th. *The finish was Lepage’s second of 2010, the other coming at Road America in June while driving owner Johnny Davis’ #04. Lepage and owner John McNelly’s #56 had come close to finishing last twice this year, finishing 42nd at Nashville in the spring and at Michigan last month. 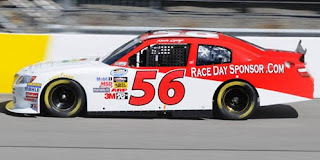 *Owner John McNelly and the #56 had finished last at Richmond just one other time, when the TEREX / Western Sizzlin car of Kevin Grubb crashed after the opening lap of the 2006 Emerson Radio 250. The team’s next start at Memphis the following month with driver Tim Schendel also brought a last-place finish when his Power Equipment Company and Texpar Inc. machine crashed 51 laps into the Sam’s Town 250. 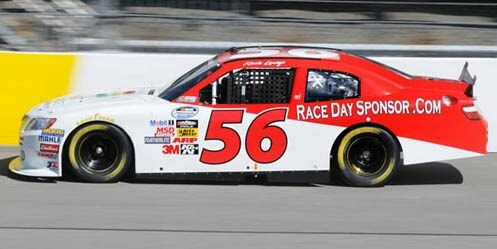 Until Friday, the #56 had not finished last in a Nationwide race after Schendel’s finish. *No driver had finished last in a Nationwide Series race because of a fuel pump issue since 2000, when Jack Sprague’s #15 Albertson’s Chevrolet fell out 17 laps into the Albertson’s 300 at Texas. Denny Hamlin picked up the 4th last-place finish of his NASCAR Sprint Cup Series career in Sunday’s Emory Healthcare 500 at the Atlanta Motor Speedway when his #11 Sport Clips Toyota fell out with an engine failure after completing 143 of the race’s 325 laps. On Saturday, Hamlin won the pole for the race at a speed of 187.380 mph. It was his first pole of the season, ending a nearly one-year drought back to last fall’s Pepsi 500 at the Auto Club Speedway of Southern California, where Hamlin crashed while leading and finished 37th. In the Atlanta race, Hamlin still had one of the best cars on the track and traded the lead several times with Ryan Newman, Tony Stewart, and Carl Edwards. In all, Hamlin would lead 74 laps, second only to Stewart’s 176. Meanwhile, the battle for last-place was unusually competitive as five underfunded teams went in and out of the garage several times for the first half of the race. Kevin Conway, driving Robby Gordon’s #7 that finished last in the spring Atlanta race, held 43rd for much of the early stages as the first car to go a lap down. 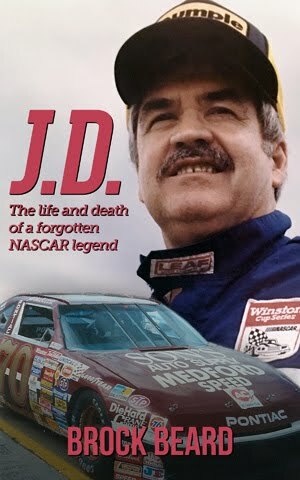 By lap 46, Conway had gone behind the wall along with LASTCAR Cup leader Joe Nemechek in his #87, plus three others who were making their first starts with new teams: Mike Bliss in PRISM Motorsports’ #55, J.J. Yeley in Tommy Baldwin’s #36, and Michael McDowell in Dusty Whitney’s #46. Unlike Conway, none of these four teams had any sponsorship, though McDowell was enlisted by Richard Childress to test a new engine package for the start of the #46 team’s partial switch from Dodge to Chevrolet. McDowell passed Conway for 43rd by lap 84, at which point his was the only car behind the wall. He remained in last when Nemechek, Conway, and Bliss returned to the garage by lap 92. First Bliss, then Conway and McDowell returned to the race by lap 110, at which point Yeley and Nemechek were the only two listed as “off.” This allowed Nemechek to bump McDowell out of the 43rd spot, where he seemed poised to extend his lead over McDowell in the LASTCAR Championship standings. However, Nemechek returned to the track 49 laps down on lap 128. The #87 held 43rd at that time, but Conway and McDowell returned to the garage immediately after, Conway edging ahead of McDowell for 42nd as Nemechek continued to log laps. When the race’s opening 133-lap green flag run ended with a debris caution, only Bliss and Conway were behind the wall with Conway now in 43rd. Nemechek and Yeley, still on the track, took the wave-around and remained on the track when the green flag waved with Denny Hamlin’s dominant Toyota still out front. Hamlin’s car was sluggish on the restart, putting him in a three-wide position with Carl Edwards and Martin Truex, Jr. as the field poured into turn one. Hamlin held his own in the Top 5 for ten more laps when, just past the start/finish line on the 144th circuit, the Sport Clips Toyota’s engine erupted in a tremendous plume of smoke. Hamlin slipped in his own oil and slid into the grass, narrowly avoiding contact with oncoming traffic as his #11 came to a rest in the infield. The failure ended Hamlin’s night. When the race restarted, both Bliss and Conway in 42nd and 43rd were still listed as “off,” allowing both cars to return to the track and attempt to pass Hamlin. On lap 168, Conway was still 43rd, but back on the track 51 laps down. Nemechek was back behind the wall at that point, but he, too, returned on lap 177. Three laps later, Hamlin had slipped to 39th beneath 38th-place Mike Bliss, who finally parked his #55 for good at that point. Unfortunately, this prevented Bliss from passing Elliott Sadler, who retired with crash damage after 150 laps. Conway passed Yeley for 43rd before he returned to the track yet again, finally dropping Hamlin to 43rd and Bliss to 42nd. Sadler slipped past Conway and Yeley for 41st five laps later. Only after Sadler moved by did Conway, Nemechek, McDowell, and Yeley finally leave the race for good in the space of a couple laps. The four drivers finished in that order from 37th through 40th. *This was Hamlin’s first last-place finish in two years, dating back to when he was involved in the grinding multi-car crash on lap 17 of the 2008 Best Buy 400 at Dover. *Neither Hamlin nor the #11 had ever before finished last in a Cup Series race at Atlanta. *Hamlin is the 36th different polesitter to finish last in a Cup Series race. The last time it happened was when Greg Biffle’s 3M Ford lost the engine after completing 234 laps of the 2008 Dodge Challenger 500 at Darlington. The 95 laps Biffle led in that race were the most of any last-place finisher, but Hamlin’s 74 laps led at Atlanta moved him into a close 2nd. *The last time a polesitter finished last in a Cup race at Atlanta was 1983, when Geoffrey Bodine’s valve failed 18 laps into the Coca-Cola 500. *The #11 had not won a pole, then finished last in a Cup race since Cale Yarborough’s engine failed while leading 5 laps into the 1980 Firecracker 400 at Daytona. Al Bonnell - 1949 Heidelberg Speedway - 0/200 - ? **Daytona's Qualifying Races counted as points races prior to 1972. All other qualifying races and non-points races are excluded from this list. Jeff Green picked up the 11th last-place finish of his NASCAR Nationwide Series career in Saturday’s Great Clips 300 at the Atlanta Motor Speedway when his unsponsored #36 TriStar Motorsports Chevrolet fell out with transmission problems after completing the opening lap of the 195-lap race. Green qualified 38th for the race at a speed of 172.775 mph and, by beating two other “go-or-go-home” teams, did not have to use his Past Champion’s Provisional to get into the race. An engine change forced Green to fall to the back before the start of the race, where he promptly went behind the wall after completing the first lap. The next lap, Kevin Hamlin, driving the #43 Curb Motorsports entry that finished last at Montreal with Justin Marks last week, and LASTCAR Driver’s Championship leader Dennis Setzer both fell out with vibration problems. It was Setzer’s first run in the Owner’s Championship-leading #92 car since he finished 42nd at Iowa in July. Green now breaks a tie with his brother Mark for 2nd in the Driver’s Championship standings, though still six finishes away from leader Dennis Setzer with nine races to go. *The #36 had not finished last in a Nationwide Series race at Atlanta since Hank Parker, Jr.’s GNC Live Well Dodge crashed 13 laps into the 2002 Aaron’s 312. Interestingly, Jamie McMurray, who won Saturday’s race, won this 2002 event as well. *Jeff Green had never before finished last in a Nationwide Series race at Atlanta.